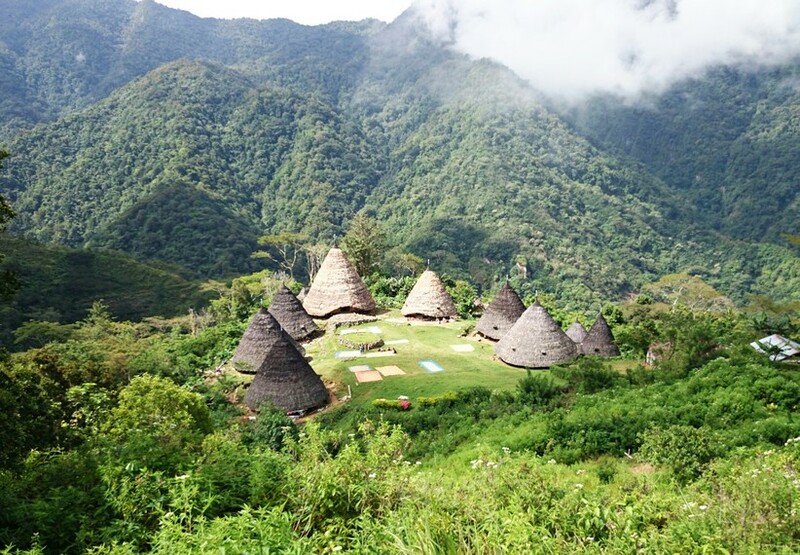 Wae Rebo is a traditional village located in a remote hamlet precisely in Manggarai Regency East Nusa Tenggara Province. 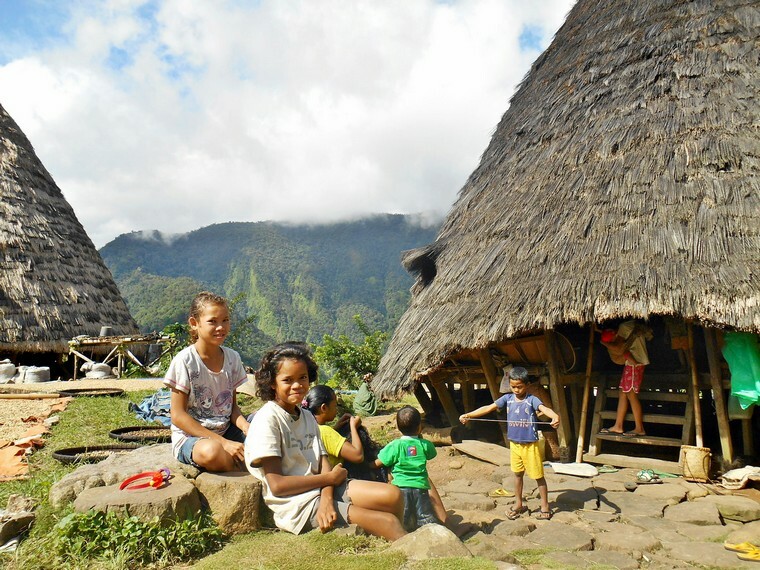 Famous as the village above the clouds, Wae Rebo is located at an altitude of 1000 mdpl surrounded by hills that are very beautiful. Wae Rebo stated UNESCO as World Cultural Heritage in August 2012 set aside 42 other countries. 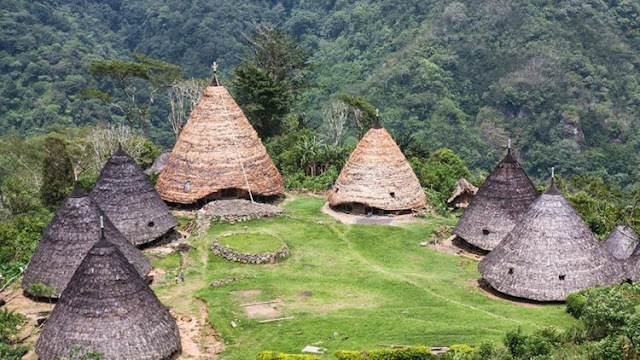 To reach Wae Rebo, visitors must travel about 6 km from Dintor Village to Denge Village by motorcycle. The journey from Denge to Wae Rebo, takes about 3 hours of climbing through a remote area surrounded by unspoiled undisturbed forest, across the river and across the ravine. Although the location is far from the crowd and difficult to reach, but Kampung Wae Rebo is very famous especially by foreign tourists countries in Europe because of its architectural design that has a high attraction. One of the interesting things about Wae Rebo Village is its conical shaped house and its roof is made of palm leaves. The result of handicrafts of citizens, coffee, vanilla and cinnamon bark as a souvenir goods brought home by tourists with a satisfactory price. Not hard to fall in love with this village. Visitors can feel the uniqueness of culture, customs, friendliness of its citizens and local wisdom that still feels thick in this village. 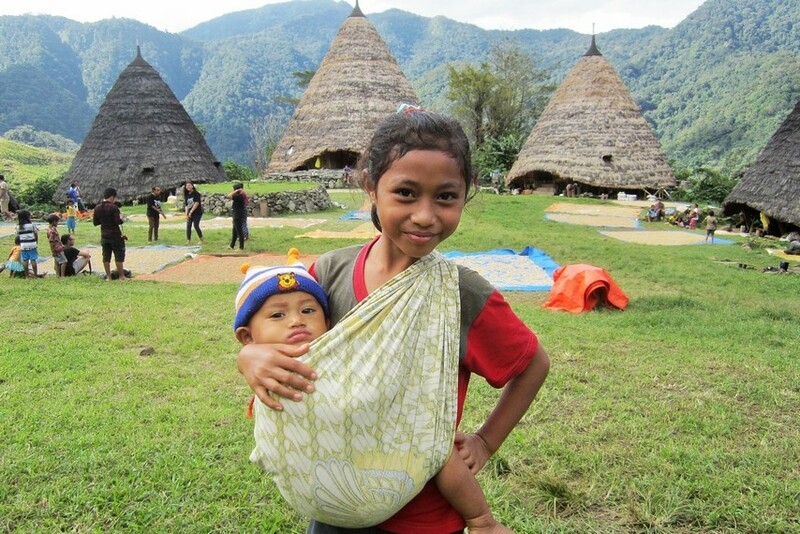 How about access and transportation to Wae Rebo? So what if we want to visit Wae Rebo? 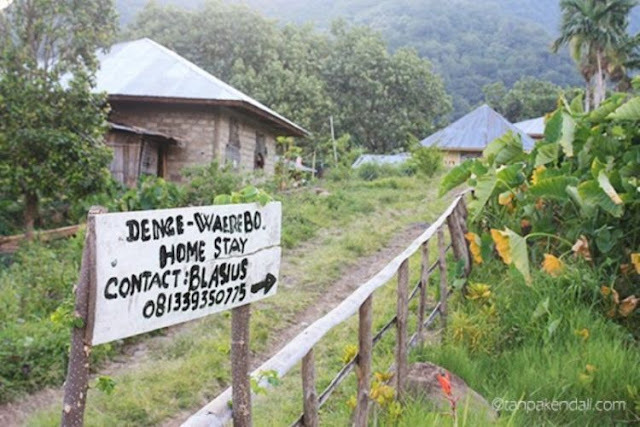 If want to see the outside world, the people of Wae Rebo must go to Denge first. The opposite is true. If we want to get to Waerebo, we have to go to Denge too. 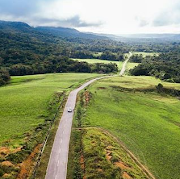 To get to Denge by public transportation, you should start your journey from Ruteng, the capital of Manggarai Regency. 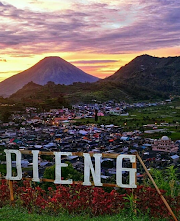 There are direct flights to Ruteng from Denpasar, just not everyday. It is convenient to get to Labuan Bajo first before continuing by bus or travel to Ruteng. Transport from Ruteng to Denge or Dintor (Dintor is a village near Denge) is not much. There is a bemo, a kind of angkot, which operates not daily. Which is available every day is wooden car, a truck that the back of the backside is transformed with boards into a passenger seat. There are only one or two pieces of wood to operate every day. They depart from Mena Terminal in Ruteng around 9 am to 10 am. Arrived at Denge around 2pm. In Dintor there is an inn named Wae Rebo Lodge. The owner is named Mr. Martinus Anggo, the original Wae Rebo man. While in Denge, the last village before the trip to Wae Rebo, there is a Wehang Asih homestay belonging to Mr. Blasius Monta - also a Wae Rebo. Near the homestay Wejang Asih also there is the Wae Rebo Village Information and Library Center. Mr. Blasius Monta and Mr. Martinus Anggo are two people who often promote Wae Rebo as a tourist attraction. To start trekking to Wae Rebo, you should leave early in the morning. The reason, about 3-4 kilometers early trip is not covered by shady trees. When you start trekking during the day, the risk is to get stung by the sunless rays. If you are late, do not even choose to go out in the evening to avoid the sun. This is not allowed. The track that you will pass is a volatile land and prone to landslides, so it is very dangerous if trekking done at night. The initial 3-4 kilometer journey is a road sufficient for heating. The climb is not too steep, and the road is wide enough. 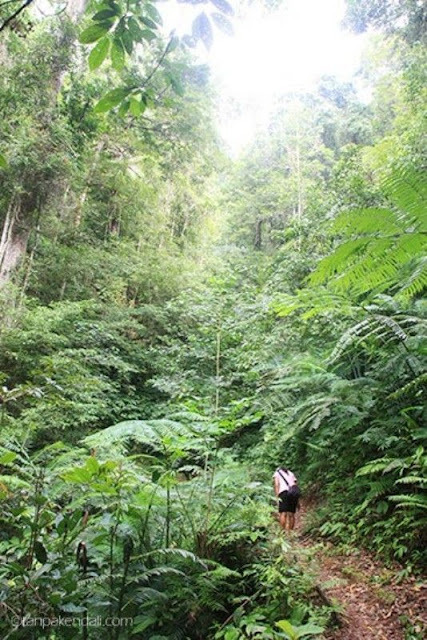 The next track is a path in the middle of a very lush forest. Several times the path is on the edge of the cliff directly adjacent to the abyss. The streets you are going to go continue to climb, until you reach the distance 2400 meters before Wae Rebo. After that, you will find a flat road. Less than a kilometer from Wae Rebo, your street will go down and through the coffee garden. Approximately 3-4 hours of trekking to reach Wae Rebo. During the rainy season, trekking land will be very slippery and become a lot of leeches, so you should be more vigilant.